Tradency, the providers of Mirror Trader, one of the leading copy trading platforms has announced the launch of Mirror Trader Portfolio (MTP). The new feature will allow users who are following and copying multiple Mirror Trader strategies to save the combined group as one portfolio. The saved portfolio can then be shared with other Mirror Trader users as an Excel file or via email. According to Tradency, MTP is slated to offer advantages to both brokers and end users. In regards to brokers, Tradency envisions firms promoting MTP-based competitions, as well as companies creating portfolios that can be disseminated to clients. 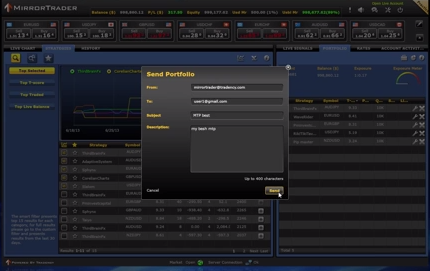 For end-user traders, the MTP feature provides the ability to archive portfolios for the future, as well as strategy distribution. Primarily a copy trading platform, Mirror allows users to choose among the system’s strategies to automatically copy their trades. Unlike social trading platforms, Mirror Trader focuses on portfolio building, based on using existing strategies in the network, rather than two-sided interaction. The MTP feature thus becomes a small step for Tradency in the social direction. In terms of similar products, eToro offers a similar portfolio-based product, its CEO, Yoni Assia having previously told Forex Magnates that it is a popular feature among users. In terms of Tradency, it’s worth watching how the product will be marketed by brokers. Within the company’s prepared remarks, they stated a use case of the “ability to promote personal portfolios (successful MTPs could be offered for sale).” While we don’t envision selling MTPs as much of a competition to the massive existing EA market, the product could be a useful feature for introducing brokers and affiliates. Specifically, broker partners could market successful portfolios on their sites, to trigger introduced clients to use Mirror Trader. With many affiliates receiving volume-based commissions, copy trading products such as Mirror Trader offer an efficient method to monetize on new clients.